First of all I wish you all a Merry Christmas!!! For this year i have prepared a Chocolate Fruit Cake which is dark intense fruity and with a hint of Chocolate. This recipe has no alcohol init and no soaking. So fast and easy to prepare fruit cake. Christmas fruit cake could be prepared in various ways. Each part of the world makes fruit cakes in various manner but the basic ingredients added are same the dried fruits and nuts. I love the dark intense fruit cakes that makes me feels like Chrismassy. I have so many Christmas cake recipes and i was in a confusion which fruit cake i have to make for this year's Christmas. 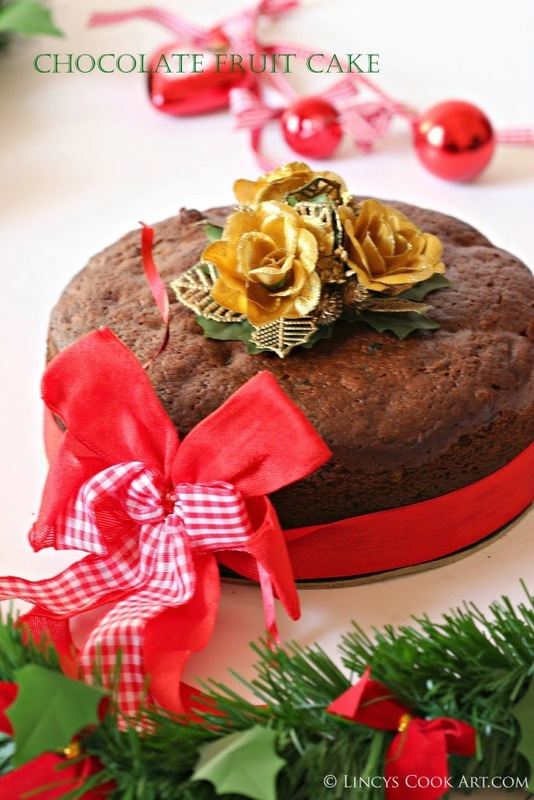 Finally i have selected this super easy but very appealing Christmassy fruit cake for this year.This cake is super easy to make and deep in colour which i am looking for. Preheat the oven to 150 degrees for 10 minutes. In a broad pan add the raisins and chopped prunes/ dates. Then add the butter, mixed spice powder, dark brown sugar, honey, orange zest from 2 oranges and orange juice from 1 and1/2 orange add remaining half at-last if needed. Then add the cocoa powder, grape juice and bring the mixture to boil in low flame. It takes about 5-8 minutes to start the mixture to bubble. Once the bubbles start appear on the edges switch off the gas and allow the mixture to cool for about 30 minutes as such or if you wan to proceed fast keep the mixture 15 minutes under the fan. Mean time prepare the cake tin by lining bottom and the sides of the cake. I have used two sheets at the bottom to prevent the cake from burning at the bottom. To protect the top of the cake from burning i have kept the side little larger the tin. In a blender jar add the blanched or whole almonds and make a powder. In a separate bowl add the all purpose flour, ground almonds, baking powder, baking soda and salt together and mix with a whisk to combine well. After around 30 minutes, the mixture will have cooled a little, now add the beaten eggs. Now add this flour almond mix into the fruit mixture and mix with a spatula until the ingredients have combined. Then carefully pour the fruit cake mixture into the lined 20 cm with minimum of 7-8 cm height cake tin (Cake raise up to the top so height of the tin is essential or use 22 cm pan). Cover the cake tin with another wax paper on top to prevent the sides from burning. Transfer the cake tin to the oven and bake for around 1 and 3/4 to 2 hours, or until the top of the cake is firm. If you insert a sharp knife into the middle of the cake the knife should come out clean. If you add more orange juice the cake may turn slightly sticky at the centre. Merry Christmas to you. Lincy that's a delicious cake.